It is common for many Westerners - even scholars - to idealize indigenous communities around the world. Many see indigenous peoples as living some ideal life that has largely been lost in the globalized West. While this view is slightly skewed, it does remain true that many indigenous peoples live a life based on traditions that can be traced back through many generations. These traditions often involve intimate knowledge of select environments built on experimentation and trial and error over an equally lengthy time period. This intimate knowledge of the surrounding environment is largely lost on those dwelling in urban areas, but nonetheless remains an important repository of human discovery and knowledge. Her group is called Quiego, short for Queremos Unir Integrando por Equidad y Género en Oaxaca (roughly, "we want to come together for equity and gender in Oaxaca"). The acronym was inspired by Santa María Quiegaloni, the name of her village of 800 Zapoteca Indians, located in the mountains of Oaxaca, one of Mexico’s poorest states. Quiego "plans to hold workshops and organise women’s groups, first in my village, and later throughout Oaxaca and anywhere else that we can, to raise awareness on women’s political rights and help them understand that some traditions are no good, but that we are not alone, and that we have to wake up," she said. 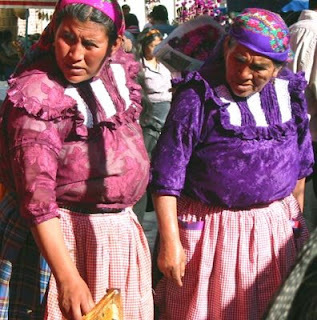 Mexico is the Latin American country with the largest indigenous population in absolute numbers, which is variously estimated to make up between 12 and 30 percent of the country’s 104 million people (the smaller, official, estimate is based on the number of people who actually speak an indigenous language). The overwhelming majority of the Mexican population is of mixed indigenous and Spanish ancestry. More than 90 percent of the 12 million officially counted indigenous people live in extreme poverty, nearly 50 percent are illiterate, and 80 percent of the children under five are badly malnourished, according to the human development report on Mexican indigenous people published in 2006 by the United Nations Development Programme (UNDP). A study focusing on gender issues by the government National Commission for the Development of Indigenous Peoples, also released in 2006, states that "among the poorest of the poor, among the most marginalised of the marginalized, are indigenous women." Very interesting article. And I especially liked your own point about the tendency to idealize indigenous cultures.